iGrow Montessori has structured all programs by keeping in mind the different stages of growth in order to fulfill the needs of each child at a certain age. Thus ensuring that all requirements and needs of the child are considered. Each program offers a selection of Montessori materials complemented by academic curriculum. It is in each of these programs that teachers are very much aware of not only the physical needs of each child, but also the formation of their character, emotional, and intellectual development. Our infant program aids children from the age group 6 weeks to 11 months. The program for infants is designed to satisfy an infant’s needs to grow and develop to their fullest potential. We incorporate flexible plan that allows each child to eat, sleep and play according to their schedule. Our safe and spacious classroom provides freedom of movement, allowing the child to move freely and explore the environment. The room is decorated tastefully with mobiles, educational toys, books to further develop their visual, auditory and tactile senses. Cleanliness and hygiene is a vital in infant classroom. All the toys and equipment are disinfected every day to prevent the spread of germs. The food provided will be refrigerated and then warmed up in the microwave, before feeding, depending on parent advice. Our caregivers provide the child with loving care, instilling trust, security and providing comfort to the child and develop a strong bond with each other. As our infant curriculum is based on development on motors skills, the caregivers engage the child with various gross motor skill activities, songs, finger plays and outdoor experience. Caregivers interact with the child through educational material and toys to stimulate the development of speech and to learn new vocabulary. Monitoring the child’s schedule and communicating their accomplishments, tendencies, and concerns is the daily routine of the caregiver. We will share our thought with parents and together we can work together to provide the best program for your child. Sensorial activities are introduced to help the child develop visual discrimination of difference in dimension, width, length and size. Children are also introduced to various sounds, smells, textures and tastes. Upon mastering these sensorial activities, the child’s sense of perception will get structured and the child will be able to comprehend abstract concept. Math materials assist the child in discovering and understanding mathematical and geometrical concepts. Children who have experienced basic concepts involved with the practical life and sensorial materials progresses naturally to the beginning math activities. 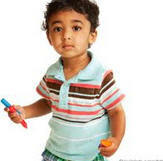 Art and Music activities help a child to express creativity and to enhance fine motor skills. Children learn by observing the teacher. We feel that it is important to model respect with each other and with the materials, which improves the ability of sharing and taking turns. Our prepared environment allows the children to have a positive experience and we enjoy being a part of their growth.